Early Wynn, the Go-Go White Sox and the 1959 World Series"
A man so tenacious on the field that he threw at his own son after he hit one back up the middle, and claimed that he would knock down his own grandmother if she dug in against him, Early Wynn was the catalyst for the Chicago White Sox 1959 World Series appearance. A rare four decade player, an aging Wynn was brought to the White Sox at the end of the 1957 season in exchange for Minnie Minoso. Bill Veeck apparently thought that Wynn had one more great season left in his arm, and Veeck was correctly, as Wynn would be victorious 22 times en route to a Cy Young award and World Series appearance in 1959. Freedman weaves in anecdotes from the few living players from that 1959 team to chronicle the season's happenings. Sadly, almost three-quarters of the team are deceased. An especially poignant moment is when the living players gather in Chicago in 2008 and they collectively acknowledge that their reunion reminds them of the many members of the team that have passed. We hear from the likes of Billy Pierce, Jim Rivera, Bob Shaw, Jim Landis and Turk Lown as they chime in on Wynn and their own ups and downs during their pennant winning journey. 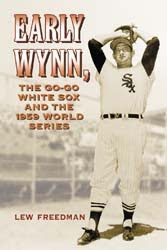 Freedman does his best to merge the three topics of his book, Wynn, the "Go-Go White Sox" and the 1959 World Series by examining the roles of Manager Al Lopez, General Manager Frank "Trader" Lane and owners Veeck and Charles Comiskey Jr.. What you are left with is a solid assembly of the 1959 White Sox and how Wynn led the charges all the way to the World Series.